The other day while scrolling Instagram, I stumbled across a delicious looking macadamia nut cheese recipe from @datesandavocados. I’d never tried one of her recipes before, but this nut cheese just looked so good. I had to try it! Calling for only five ingredients, it’s quite simple, but requires quite a bit of ‘waiting time’. It’s worth it! 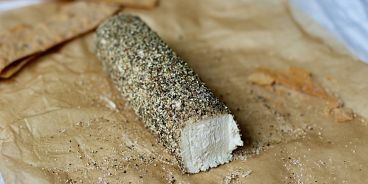 The end result is a dead ringer for Boursin (that soft creamy cheese made with factory farm dairy that your family used to serve as an appy for dinner parties? …at least mine did!). Here’s the original Macadamia Nut Cheese recipe and scroll down for my adaptation. Soak nuts in water overnight. (I left mine in water in the fridge for three days and they were fine — so if you can’t get to them in time, no sweat). Strain and rinse your nuts, then add to a high-powered blender along with 6 tbsp water and blend until silky smooth. Add in your probiotic (the stuff inside the capsule, not the capsule itself) and blend until it’s incorporated. If you’re using the same probiotic that I used, you’ll noticed it’s not in powder form. Next time I make this cheese, I’m going to dissolve the Proviotics in a very small amount of water and then add to the creamy nut mixture so it disperses better. That said, the way I originally did it (adding the pill’s contents in broken up bits) seemed to work just fine. Transfer your nut mixture to a nut milking bag or cheese cloth, gather up the ends to create a ball. Secure the ends and squeeze out any excess moisture. Place your ‘cheese’ in a warm spot for 24 hours (next to the heater behind my couch worked for me) to let it ferment. 24 hours later, transfer cheese from its cloth or bag to a medium sized bowl and stir in your garlic, lemon juice and salt. At this point you could add in other flavours, like herbs, pimentos, more pepper, whatever you like! Next, form a log (see pic) on a piece of parchment paper and place in fridge (covered) overnight (or for a couple days if you can’t get to it – it won’t go bad). Last step is rolling in a salty black pepper mixture. On a flat surface, spread out your pepper and sprinkle on some salt. 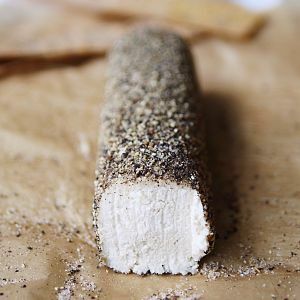 Take your cheese log and give it a good roll in the pepper and then fill any holes by hand. Voila! Hope you enjoy as much as we did! !